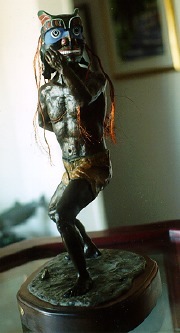 Bukwas, or wild man of the woods, is a significant supernatural spirit being of the Kwaglulth Nation and casts a haunting figure in their great annual winter dance. He is linked with the underworld of the dead, and with ghosts -- especially the spirits of the drowned, who hover near him. Mysterious and illusive, he lurks nears the edge of the dark forest in which he lives, offering food to lost humans, luring them to become spirits in his shadowy underworld. 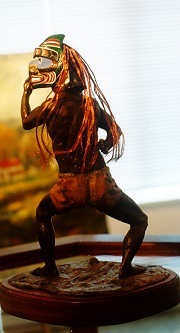 The figure represents a Kwaglulth dancer wearing a carefully carved cedar mask, portraying Bukwas creeping to a sandbank on a sunny morning to dig for cockles, his favorite food. Very shy, he peers about to see if he is being watched as he shields his face from the sun with his hands. Suddenly he leaps forward, settles on one knee searching for cockles, and devours them quickly, sometimes uttering a high pitched whoop or shriek from a concealed whistle.